Come and experience a thrilling and challenging full day alpine hike in the Wilder Kaiser in Austria that will take you to the tops of Tuxeck and Treffauer with one of our certified guides. Enjoy an exciting and challenging trek in the Wilder Kaiser Mountains. Hike to the summits of 2 great peaks: Tuxeck and Treffauer. Enjoy fantastic views of the Austrian Alps. Are you looking for a hike that will not only provide you with amazing views, but will also challenge you physically? Are you looking for a trekking opportunity that will truly feel like an arduous expedition? 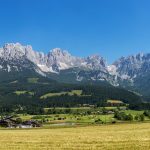 Then this full day hiking tour in the Wilder Kaiser Mountains of the Austrian Alps is definitely for you. Along with exploring the beautiful and tough Wilder Kaiser Mountains during this trek, you will also get to reach the top of 2 wonderful peaks. Those peaks are Tuxeck (2,226m) and Treffauer (2,304m). Each of these peaks provides its own unique set of views from their respective summits. While there are some tough spots during this trek, you can rest assured you will be properly guided the entire time. Thus providing you with an experience that will be as secure as it will memorable. To participate on this trip, you should be in good physical condition. You should also have prior alpine trekking experience. It’s not every day that you can scale 2 peaks, while trekking through an area like the Wilder Kaiser Mountains of Austria. However, on this full-day trip that is exactly what you will get to do. To join us on this expedition, all you have to do is send us a request. Would you like to climb the Matterhorn of Zillertal? Then join us on this 2-day ascent of the stunning Zsigmondyspitze peak.